Cortelco Inc. Keeping You Connected for 122 Years! Complete Product Families, Outstanding Customer Service, Commitment to Quality - To take a look at our 2016 Solutions Guide please click here. Cortelco offers a variety of products for residential markets and business applications. We provide traditional single-line telephones, 2-line models and 4-line feature phones with voice mail and auto attendant. Our line-powered CID Model 2730 is a popular choice for many universities. The C Series IP products help users streamline voice communications across multiple IP Platforms. If you need Custom logo products, we have various models available and we only require a nominal minimum quantity purchase. 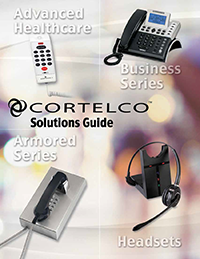 Cortelco has been providing telecommunications equipment and solutions for 100 years. The secret to our longevity is simple...good service...great support...and excellent quality.